Like most search engines, Google doesn't show too many results from a domain on a single search results pages. Until recently, Google displayed at most 2 consecutive results from a site, followed by a link that restricted the results to that site. Some recent results show that Google adjusted this policy and it now allows 3 or even 4 consecutive results from the same site. Google also displays 4 additional results bellow some forum threads and it makes it easier to find more results from a site without opening a new page. Good its more structured ,otherwise it may appear as redundant information. Why do they think this is a good idea? Isn't the idea to give the user a selection of results to choose from? 1) Someone at Google looked at the "preview" pane offered by Bing and thought that there was UX value within. My mother, an over-educated woman with discretionary income (read: potential ad clicker) who serves as my litmus test for all thing UX (I'm in that small User Experience "focus group" as well), found the Bing additional offering redundant -- and I find the Google offering both redundant but also confusing. 2) Why hasn't Google been able to drill-down further into domains to deliver the one result within a domain that most closely matches my query? So often I've gotta' do the drilling myself. so basically top ranking sites now get more slots? Actually, this is fairly logical. 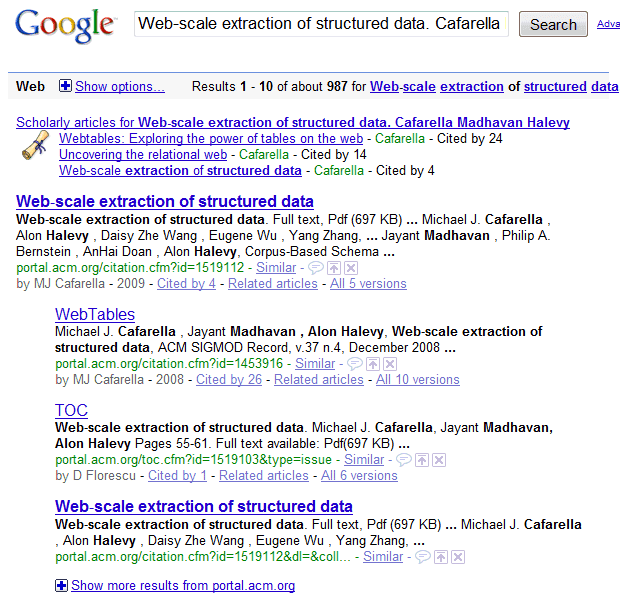 If you look at their example results, the first one is a very specific query. They will probably use this only when the relevance of sites beyond the first is dubious. If the first result has very strong relevance they offer a few extra options. The second result is qualified by a query term that matches a high-profile domain name. 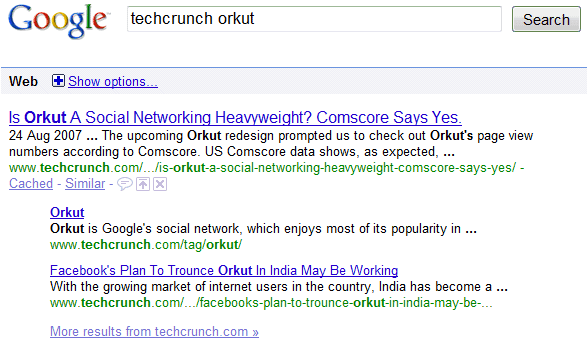 The user is pretty clearly interested in Orkut articles on Techcrunch. This does not look like something that will be ham-fistedly applied across the board. Instead, it looks like if there are strong-probability matches from a specific site, Google will attempt to offer more options within that site. It's not a good UX to wider options if the options are less relevant.